Gotta wonder if this isn't a case of people counting a whole lot of chickens that haven't hatched yet. Sure, Tesla is much cooler than those old companies, but they still make and sell a lot more cars than Tesla does. DETROIT — By almost every measure, General Motors has been on a roll. Its bellwether pickups and sport utility vehicles have hit the sweet spot in a record-setting American market for two years. The company is steadily increasing profits and revenue. And President Trump has vowed to ease regulations and put cars at the forefront of his crusade to add manufacturing jobs. In short, G.M. has come a long way from a near-death experience eight years ago, when it filed for bankruptcy and needed a $49 billion government bailout. But apparently investors have yet to be convinced that G.M., the nation’s largest automaker, has put its troubled past behind it. In a sign of how the industry’s future is being reimagined, the electric-car maker Tesla passed G.M. on Monday as America’s most valuable auto company. With its stock gaining more than 3 percent for the day to $312.39, Tesla has a market capitalization of $50.9 billion, just a hair ahead of G.M.’s. While the rise of Tesla is based on prospects rather than profits, G.M. is being dogged by its checkered history, and a perception on Wall Street that its days as a dominant force are over. G.M. is working hard to establish its own bona fides in automotive innovation, developing home-grown technology, acquiring or investing in Silicon Valley companies with promising approaches to self-driving or ride-hailing systems, and bringing a new electric car, the Chevrolet Bolt, to market. “We are spending money on the future, whether it is in mobility, autonomous vehicles, artificial intelligence or electrification,” said Mark L. Reuss, G.M.’s executive vice president for product development. Yet the moves have so far failed to impress investors. The company’s shares are about 13 percent lower than they were when Mary T. Barra became chief executive in early 2014. And now an activist shareholder, the hedge fund Greenlight Capital, is pushing for a financial restructuring to unlock more of the company’s value. G.M. is hardly alone in being outshone by Tesla among investors. A week earlier, another century-old Detroit icon, Ford Motor, fell behind Tesla in market value. And Fiat Chrysler, the parent of the third Detroit automaker, is so uncertain of its own future that it is actively seeking a merger partner. But G.M. epitomizes both the frustration attached to the old American auto industry, and the determination to prove the skeptics wrong over the long term. Let's see, last year Tesla produced about 83,000 vehicles and delivered 76,000. I guess if they were able to produce more, they could have sold a lot more and investors are thinking ahead. The only bottleneck right now seems to be how fast can they ramp up production. The demand is there. Meanwhile GM sold over 10 million worldwide. So over 100 times more than Tesla. Operating profit was $12.5 billion for GM. Tesla meanwhile has yet to actually make a profit and is not forecast to make a profit this year either. Still, based on past experience I expect Tesla's share price will probably continue to grow. You still fantasize about owning a car with will immediately become ワイフ様か娘さんの車. All I know is that as much as I want a Tesla I need a GM [or other pragmatic brand]. We just bought a new Honda CRV about two months ago. We were looking at the Hybrid Accord but I couldn't justify the extra cost and risk. I keep cars until they die and I still don't trust the battery technology enough to invest in it. Next decade for sure. I also wanted the CVT model but as cool as CVT is, I don't trust that yet either. Tesla is a luxury carmaker that benefits from political corruption. It is "worth" more due to money stolen from you. Rob Lister wrote: All I know is that as much as I want a Tesla I need a GM [or other pragmatic brand]. We just bought a new Honda CRV about two months ago. We were looking at the Hybrid Accord but I couldn't justify the extra cost and risk. I keep cars until they die and I still don't trust the battery technology enough to invest in it. Next decade for sure. Nothing says car is a nuisance that I have to endure like getting CVT. Tesla starts delivering Model 3. 30 units delivered so far. Btw, I checked the stock price and it is still valued more than either GM or Ford at current share prices. Tesla is worth $55 billion, GM $52 billion and Ford $44 billion. The early word from reviewers looks promising for Tesla. Their verdict: the Model 3 is not only impressive by electric vehicle standards, it’s a spectacular car by any measure. Any qualms tend to focus on a slight learning curve for dashboard controls, limited fast-charging infrastructure, and the cost for some of the premium features. No doubt issues will arise, but this is Tesla’s honeymoon. Quartz rounded up the (sometimes breathless) highlights from the major reviewers about the new car. The Model 3 feels like an automotive tipping point, writes Wired’s Jack Stewart. Tesla’s debut could mark the point at which almost anyone—not just Tesla fans and the environmentally conscious—could see themselves driving an electric vehicle. Motor Trend showered the Model 3 with superlative praise. “The Tesla Model 3 is […] the most important vehicle of the century,” the magazine writes. “Yes, the hyperbole is necessary,” it continues, likening the Alfa Romeo Giulia X’s performance to a “wet sponge” compared to the Model 3. “The car sprints like an Olympic 100-meter champion,” raves USA Today. The $35,000 standard version hits 60 mph in 5.6 seconds with a top speed of 130mph (the upgraded version is slightly faster). The Model 3 has a smaller battery pack so it can’t perform the same theatrics as its premium cousins (an extra fast “Ludicrous” mode). But that didn’t seem to faze reviewers. High-torque electric propulsion means the Model 3 still has a significant acceleration advantage over internal combustion engines. Tesla’s engineers also apparently took advantage of the car’s low center of gravity (the battery pack fits neatly under the chassis) to give it crisp handling. “The Model 3 is so unexpected[ly] scalpel-like, I’m sputtering for adjectives,” sputters Motor Trend. The Model 3 comes with the same eight cameras, radar, ultrasonics, and plenty of computing power that the premium Model X and S offer. Although it costs more to activate Autopilot and advanced self-driving features, the car already has the ability to take over highway driving and other chores for drivers. Testing the semi-autonomous Autopilot, TopGear’s Charlie Turner called it “a system that still feels like witchcraft.” In what is likely to become a standard feature in many cars, the gear shifter has an extra setting: Park, Reverse, Neutral, Drive— and Autopilot. Tesla says it designed the interior of the car for the day when cars will drive themselves, and there’s no need for myriads buttons and displays. Appropriately, the Model 3 exterior feels “like a cockpit from the future,” says Mashable. 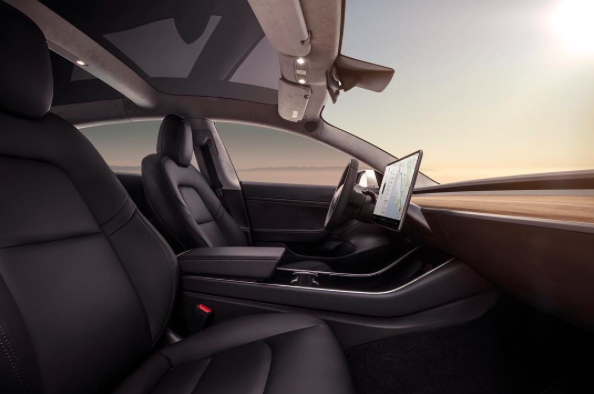 The challenge was to provide expansive interior space, even as it shrunk the car compared to the Model S. “Subjectively it succeeded,” judges Motor Trend. 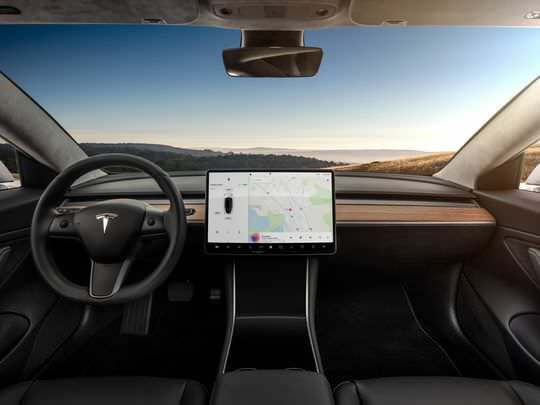 Tesla replaced the typical automotive dashboard with a “stylish, Scandinavian” touchscreen console, a horizontal 15-inch display that gives drivers all the information they need. Few buttons exist besides some thumb controls on the steering wheel. Multiple storage areas are tucked into the front of the car, as well as two smartphone charging docks. The individual vents for hot or cold air are replaced by thin openings in the dash blowing air into the cabin, and controlled by touching the screen and swiping where more AC or heat is desired. They like this look? The screen looks like it was tacked on as an afterthought. No sir, I do not like it. But I suppose I would take one if offered. Short long of it: Lady buys an electric car [in Canada] and plugs it into the outlet meant for a block heater at her assigned condo parking space. Two weeks later the power to said outlet is cut. The condo board sent her a letter saying she can't do that for reasons I'm sure most of you can figure out. Lesson: the transition to electric cars is slow and that is a good thing. While the technology is [pretty much] there, the infrastructure still has a ways to go. Rob Lister wrote: The screen looks like it was tacked on as an afterthought. It's designed to be easily upgraded to a 72 inch screen if desired. And for those who miss the drive-in movie experience, you can also get that in 4K. 72 inches in a car? If I owned any Tesla stock, I think I'd sell it. In July, Tesla Chief Executive Elon Musk warned that “production hell” was ahead for Tesla’s new and long-anticipated Model 3. He wasn’t kidding. On Monday, the company said it had only produced 260 Model 3 cars from the start of production in late July through September 30, far short of the 1,500 the company had forecast. That’s bad news for Tesla. The success or failure of the Model 3 could make or break the company. The car is billed as a more affordable alternative to Tesla’s luxury Model S and Model X. The company had planned to be churning out 20,000 of them a month by December, and 500,000 a year by the end of 2018. In a note to investors Monday, Tesla blamed “production bottlenecks” but offered no details. The company did not say whether its December or 2018 production forecasts remain on track. The Model 3 production numbers were included in an investor message, posted online, that touted “our all time best quarter for Model S and X deliveries.” Tesla delivered 25,930 of those cars, up 4.5% over the same quarter last year. Tesla critics saw little to crow about. Sales of the Model S and Model X have remained in the low to mid-20,000s for the last four quarters, sowing doubts about whether sales growth for those cars is nearly tapped out. Although sales are tiny compared with the major auto companies and Tesla has spent billions in cash without profit, its stock price has exceeded that of Ford and General Motors. In the last three weeks, however, Tesla’s stock is down around 10%. It closed up 43 cents Monday to $341.53 but fell in after-hours trading. Yeah the stock market still says this company is worth more than GM or Ford, but that is counting a lot of eggs that haven't hatched yet. The demand is there (for now) but they have to produce the cars to meet the demand. Government subsidy is still the only thing that can keep them profitable. On the batteries--I think you can consider it a given that you will need to replace the expensive battery in a hybrid at least once during its lifetime, depending on when you consider it "dead". That should definitely factor into your spending decisions. In my 2004 Honda it lasted about 7 years. After replacing it, I would have kept it much longer but it wound up totaled. My 2012 isn't that old yet, so no further experience to report yet. I do wonder what all the CVT hate is about. What kind of nuisances do you endure? CVT is a beautiful technology that is not ready for prime time. The belt does well for the first 20K-50k miles or so and then slips, breaks, goes off-kilter. They are getting better but the weight reduction and efficiency but do not yet reach cost effectiveness. It needs to last at least 100k miles. non-linear transmissions typically last 200-300k miles. They will get there. I'm bullish. So will batteries. I've had mine for longer than 100K, is there something I should be looking for? Not challenging your point, in fact I'm wondering if I'm running with something off in my transmission by now. gnome wrote: I've had mine for longer than 100K, is there something I should be looking for? Not challenging your point, in fact I'm wondering if I'm running with something off in my transmission by now. Nay, if it is working for you, good. Tesla fans won't get to see the company's electric semi-truck until mid-November, Elon Musk tweeted on Friday. The event had been planned for Oct. 26 in California, but now Musk says it will take place on November 16. The reason: Tesla says it's "diverting resources" to fix problems with the production of it Model 3 sedan and to manufacture more batteries that it can send to areas affected by recent hurricanes. Tesla (TSLA) announced earlier this week that that it's far behind on its planned production of the Model 3, its new, more affordable, electric car. During the first quarter, Tesla produced only 260 of the cars, far fewer than the 1,500 it planned to make. I guess it's admirable that they want to manufacture batteries for the areas affected by recent hurricanes, but I wonder if it's putting their production schedule even further behind the 8-ball. 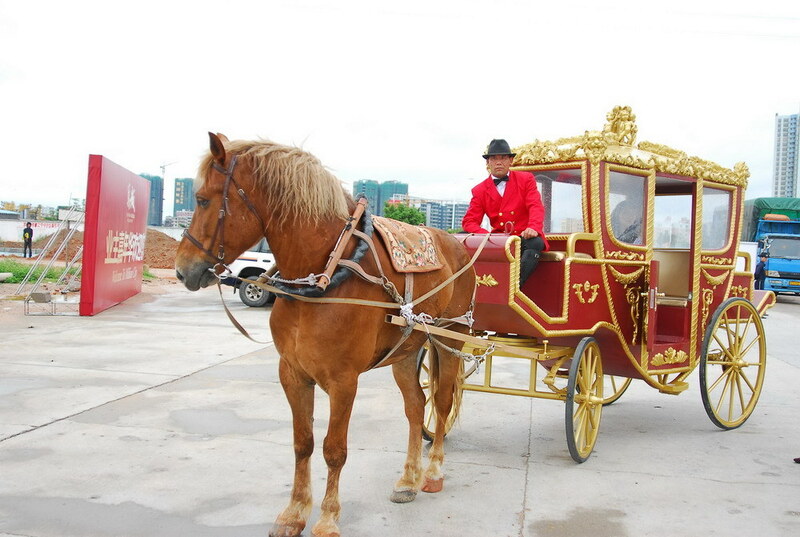 Paying customers have put down deposits to buy these things. He has both good ideas, but also some far-fetched ones. The hyperloop is a technological pipe dream as far as I can tell. Like a space elevator. Neat idea in theory, but too difficult to realize in practice. Tesla also pushed back its production plans for the Model 3 by a full quarter — a 5,000-unit weekly run-rate now won't arrive until the end of the second quarter of 2018. Looks like reality may finally be catching up. At least Tesla is no longer worth more than GM. And its credit rating rating has been downgraded. Moody's lowered its corporate family rating on Tesla to B3 from B2 and changed the outlook to negative from stable. "Tesla's ratings reflect the significant shortfall in the production rate of the company's Model 3 electric vehicle," Moody's said in a release. The price on Tesla's eight-year junk bond, which matures in 2025, fell to its lowest since it was issued in August. It hit 90.8 cents late Tuesday afternoon just ahead of the Moody's announcement, according to IHS Markit.